Managed futures can be an attractive alternative because they are specifically designed to make money in both up and down markets. 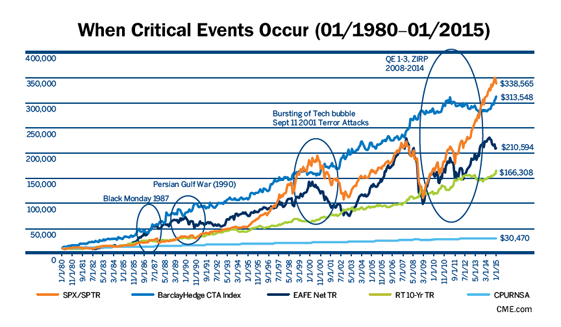 Their performance is not dependent on the business cycles, as some of the best years for managed futures have occurred during bear markets or recessions—lowering your overall investment portfolio risk. The key benefit to investing in managed futures is to reduce portfolio volatility due to the uniquely low-to-negative correlation with all other asset classes, everything from the stock market and real estate to fine art and collectibles. shows they can also increase your total return. But isn’t inflation dead? The fact is the threat remains very real and is growing in a way few people understand. The rapid proliferation of futures exchanges and new contract listings around the world give CTAs an ever increasing trading vehicles and strategy combinations. Rutsen Meier Belmont (RMB) Group uses our experience, personalized service and plain English to help clients understand this powerful asset class in jargon-free language. RMB spends the time getting to know their customers, helping them find CTA money managers and managed programs best-suited to their individual investment needs. We are constantly on the lookout for new, up-and-coming CTA talent. RMB Group principals have been trading futures and options since 1984. RMB Group started its Managed Futures Account Division in 2001. At RMB Group we use simple language to explain basic principles. Our managed futures booklet, “Opportunities Outside the Stock Market” teaches you the ins and outs of managed futures in just 30 easy-to-follow pages. Click here to download a pdf. RMB Group constantly monitors the performance of the Commodity Trading Advisors (CTAs) we follow. We alert customers if we see major deviations from established trading styles and track records or if we find other CTAs that may better fit client needs. RMB Group clears all of its managed futures business through R.J. O’Brien & Associates. Established over 100 years ago, RJO is the largest, privately owned futures clearing merchant (FCM). It is known in the industry for its financial stability.